Fighting fans want one particular guest character in Mortal Kombat 11: Shaggy. Yes, Scooby-Doo’s Shaggy. 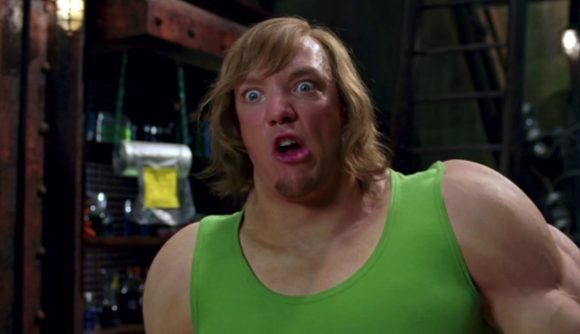 If you’ve blinked recently, you might’ve missed the fact that Shaggy’s Eldritch knowledge and incredible fighting prowess are now a Chuck Norris-like meme, and consequently a petition for him to join the Mortal Kombat 11 roster is quickly approaching 100,000 signatures. The current count is 89,769, and I’ve already had to revise this line multiple times while writing this story. The ultimate goal is to reach 150,000, though it’s unclear what that specific number is meant to accomplish. Let’s be real – jokey Change.org signatures do not necessarily translate into actual DLC character sales. It’s not altogether impossible. Scooby-Doo appears to be under the Warner Bros. umbrella, as is Mortal Kombat developer NetherRealm. The same set of convenient ownership led to regular crossovers between MK and DC, and previous NetherRealm guests have gone as weird as the Teenage Mutant Ninja Turtles showing up in Injustice 2. Still, I have to think WB would be a little reticent to let a beloved children’s character be eviscerated in a gross collection of MK fatalities. MK creator and director Ed Boon is up on the memes, as you might expect. Mortal Kombat 11 is set to launch on April 23, though it’s unclear exactly how long we’ll have to wait for further DLC reveals. Hope springs eternal for Shaggy in the meantime.